Kansei Matsuno is a self-taught knifemaker who hails from the central region of Japan, with access to both cities and wildlife areas. 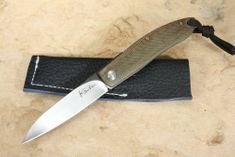 His lifelong passion for fishing and hunting led him on a search for a knife that could live up to his expectations, and eventually to create custom knives for himself. With a determination we can't help but admire, Kansei (pronounced Can-See) began simply, buying steel billets and shaping them with a file. After a couple years he moved on to a belt sander. Finally in 1992, he upgraded to the Burr King knife grinder and achieved tremendous results. Soon friends were requesting custom-built knives tailored to their needs. 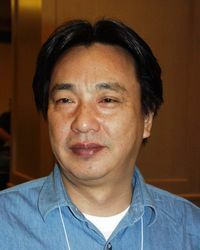 Kansei Matsuno uses the blade mark of a signature of his his first name, "Kansei". By 1998 he was able to devote himself to full-time knife making and has since gained worldwide recognition for designs that are as known for their impeccable quality as for their striking originality. That's what brought him to our attention. 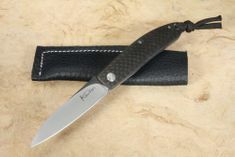 Matsuno custom knives are distinctive; you know who made it even before you see his maker's mark. 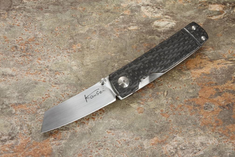 His folding knives feature solid construction and functionality that's a wonder to behold. You just won't believe how smoothly they open and close until you try one yourself. It's obvious that each knife was made to be useful for the task at hand, and distinctive enough to carry with pride. Most of Kansei's knife handles feature materials from nature such as high tech carbon fiber to a range of natural handle materials.